Last Saturday, SP was out & about for most of the morning & afternoon. When he got home, we pondered whether or not to have a 'date night.' On the one hand, we hadn't had a date night in at least a month and there are several movies we'd like to see. On the other hand, it was snowy, freezing cold, slushy, salty, and did I mention cold? Two weekends ago, right after New Year's Day, we decided to be hibernating wimps and we stayed in all weekend. That's what pushed us to brave the cold - we didn't want to feel wimpy again and we didn't want to spend another Saturday night at home. So I bundled up in my warmest sweater and jeans, found some warm socks and my boots, wrapped a scarf around my neck, donned the wool winter coat and flipped the hood over my head, pulled on my green knit gloves, and off we went. We went about 1 mile down the road to Cinemark Robinson - barely enough time for the car to start to warm up!!! We saw 'Avatar' in XD-3D. That means I had to wear those dorky glasses for 2.5 hours - they started to rub against my head and annoy me halfway through the movie! 'Avatar.' I agree with most reviews I've read: it's visually stunning, especially in 3D, and the story is just strong enough to propel the movie along but not too deep and thoroughly predictable. If you see it, definitely pay the extra cost to see it in 3D. At Cinemark Robinson it was $12.50/person for the 3:45 pm showing. When we left the theater, it was about 6:30 and we were hungry. M&M's & Coke were sort of roiling around in my tummy. I needed real food! As did SP since his sugar was starting to go low. We were in Robinson and for those who know the area, it is filled with chain restaurants. Yes, we love being so close to all the chain stores and almost any chain restaurant one can name, but... Although we sometimes eat at the chains, we no longer get too excited about them. We'd almost rather go home and cook. I definitely wasn't up for one of the non-chain places, like Chinese or pizza, after eating at such places and suffering holiday stomach distress. Nor did I want a quickie kind of meal, like a hoagie from DiBella's or Uncle Sam's. So we decided on Bocktown Beer & Grill - a non-chain restaurant. 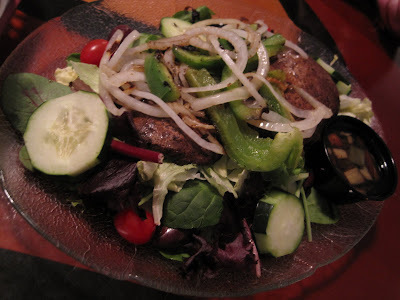 We've been here several times (see blog posts in July, August, October) and always enjoy our meals. There was a short wait but I wasn't complaining since there was a wonderful space heater in the entrance way!!! I held my hands out like I was at a campfire and tried to thaw a bit! Soon enough we were seated in the toasty back room. There was a mirror on one wall which enabled me to see the reflection of the Jets-Bengals game. SP got a beer, I got an iced tea, and we spent a good amount of time debating fresh cut fries. The fresh cut fries are really tasty and I was feeling very munchy, but fries aren't too healthy, but... they're so tasty at Bocktown. 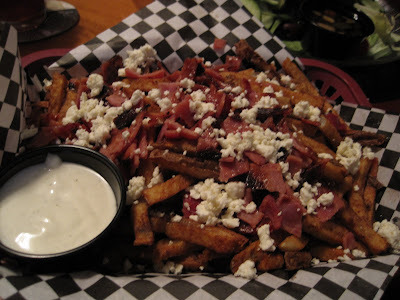 We decided on a small order with feta, capicola, and ranch dressing. SP went the healthy route and ordered the Bocktown 'Bella Salad for dinner. It's marinated and grilled portabellas with mixed greens, cucumber, peppers, kalamatas, tomatoes, onions, and a tomato pepper vinaigrette. He said it was really tasty. He also ordered a cup of the She Crab soup, which he gets almost every time we are there. It arrived after his salad with apologies from our waitress, who was very friendly and fun. I stayed unhealthy and ordered the Bocktown Burgher but substituted chicken for the burger. It comes with bacon, cheese, BBQ, and onion strings. The onion strings were missing from my sandwich, which was really disappointing because I love onion strings. On the other hand, they're not so healthy, and our waitress had mentioned some issues in the kitchen that night, so I didn't say anything. Plus, I was so hungry that I ate one third the sandwich before I realized the omission and I thought it would be in poor taste to complain after devouring that much of the sandwich. It was still a darn tasty sandwich. 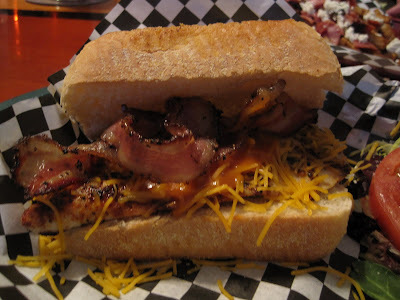 That Italian bread is so good, and the bacon... Mmmmmm. No dessert for us since we were stuffed. I delayed our return into the frigid night by sipping every last drop of iced tea - and that's unusual for me since usually I am hard-pressed to finish even half of an iced tea. I just don't seem to drink a lot when I'm out! But eventually I had to bundle up again and brave the cold. It was really, really nice to have a date night with SP, even if it was super cold and windy and slushy! !